© 2019 Mount Dennis Weston Physiotherapy and Chiropractic Centre, All right reserved. We use a Painless Needling Technique with standard acupuncture, electro-acupuncture, and dry needling. We provide a unique style of contemporary medical acupuncture with Traditional Chinese Medical acupuncture points. Originating over 3,000 years ago in China, acupuncture is one of the oldest forms of therapeutic healing modalities in the world. Acupuncture treatments work by inserting extremely thin metallic needles just below the surface of the skin. They are inserted into specific acupuncture points of the body to stimulate a relaxing effect for muscles and nerves. Because the needles are so small, there is usually little to no discomfort with the treatment, which we call the Painless Needling Technique. An electrical stimulus may be applied to the needles, which is called electro-acupuncture. 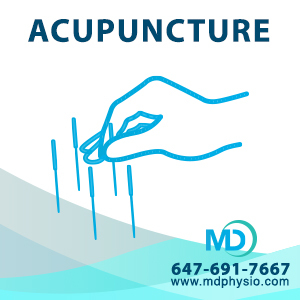 At Mount Dennis Weston Physiotherapy and Chiropractic Centre, acupuncture treatments can be performed by our physiotherapists and chiropractors. We use a combination of electro-acupuncture, contemporary medical acupuncture, traditional acupuncture, and dry needling, depending on the specific needs of the patient. Acupuncture treatments work by promoting more blood flow and oxygen to specific tissues, which helps to reduce pain, decrease stress, and promote total body relaxation. Acupuncture is a fantastic choice of therapy to use in combination with massage therapy and traditional physiotherapy and chiropractic. 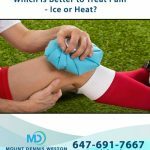 Which is Better to Treat Pain – Ice or Heat? 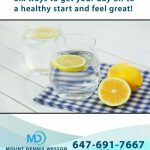 Six ways to get your day off to a healthy start and feel great! 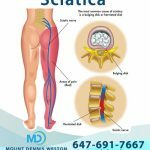 At Mount Dennis Weston Physiotherapy and Chiropractic Centre, located within the Mount Dennis Weston Health Centre, we offer a multi-disciplinary and integrated evidenced-based approach to treat and manage all types of injuries and musculoskeletal conditions. Our friendly and approachable team consists of physiotherapists, chiropractors, and massage therapists. Delivering excellent patient care is at the centre of all that we do.